Get the most out of every day, with an active lifestyle and balanced, healthy nutrition. High in protein and low in sugar. 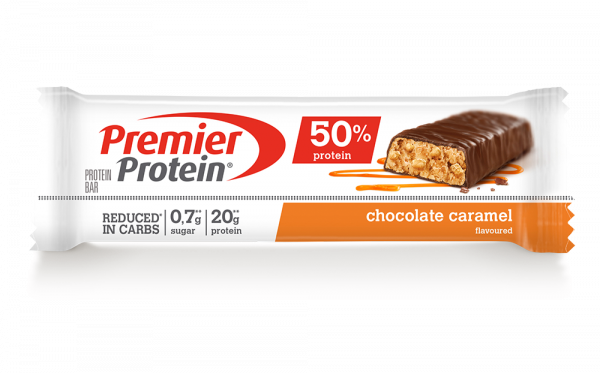 New Premier Protein HIGH PROTEIN BARS: 20 g protein*. Only 0,7 g sugar*. Milk chocolate couverture with sweetener (18%) [sweetener (maltitols), cocoa butter, milk powder, cocoa mass, emulsifier (soy lecithins), flavouring], calcium caseinate (from milk) (16%), humectant (glycerol), hydrolysed collagen (15%), soy protein (12%), water, whey protein (milk) (7%), soy crisps (4,5%) [soy protein, starch, salt], caramelised sugar syrup (glucose syrup, sugar), flavouring, salt, sweetener (sucralose), emulsifier (soy lecithins). May contain traces of nuts, peanuts and gluten.